Breeders Cup 2015 - Day one - Jen loves Clark! 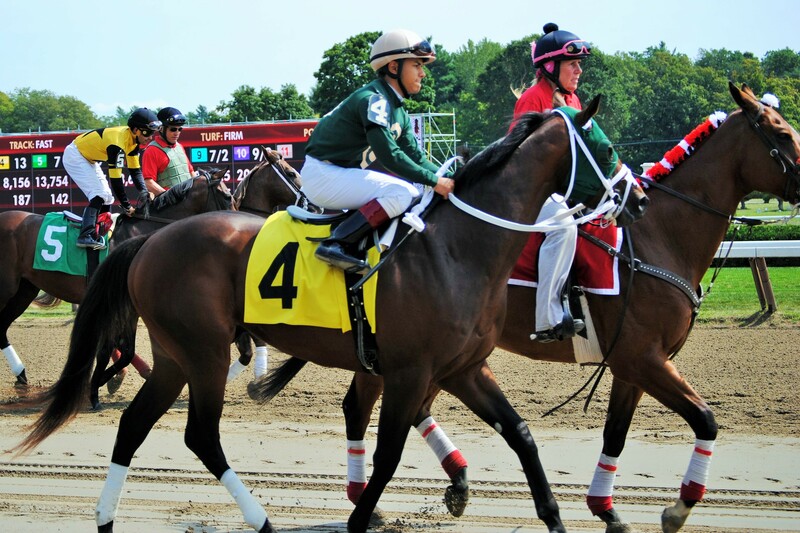 One of the favorites for the Distaff, Sheer Drama, winning the Personal Ensign this summer at Saratoga. Morning Line favorite - Airoforce at 4-1. Had nice win at Keeneland recently. Odds are about right. My gut tells me a European bred will win this, but which one? Cymric looks like the classiest of the lot but is stuck with a horrible outside post and may well blow the first turn. Have my eye on 20-1 shot Ray's the Bar, who is trained by Chad Brown - the best in the North American game with young turf horses. Ray's the Bar was bred in Britain, won at Ascot, then came to America to point to this race. Got stuck in traffic in his prep but still managed to close well for third. The long Keeneland stretch should help him. ETA 3:48 - Longshot Manhattan Dan set the pace and almost wired the field, until stopping with less than a 1/16th to go. Turned into the typical turf cavalry charge, where it comes down to getting a good trip and having the highest turn of foot. Advantage Europe, and sure enough Ryan Moore delivered Hit It A Bomb to perfection. Aidan O'Brien, perhaps Europe's greatest trainer, won't go home winless today! Morning Line favorite - Liam's Map at 1-1. Deserved favorite - will be hard to beat. Should get a lone lead and I really doubt he'll come back to the late closers. Bet $10 Exacta on 3 with (5 and 7). Looking for two long shots to pick up the pieces. ETA 4:16 - Liam's Map just put up one of the bravest performances I've ever seen, though you may have to know more about him to appreciate it. He's a frontrunner with brilliant speed who normally gets a big lead early and dares the rest to come get him. Here, he broke slowly and was swallowed by the field. The other horses formed a box around him, and every time he tried to find a hole, the other jockeys would shut the door. But jockey Castellano was patient, and finally found a gap. In just a few strides, it was all over. What a horse! Morning Line favorite - Harmonize at 7=2. Has the advantage of a recent win over the course. Was only a neck better than Sapphire Kitten though, and the latter seems a much better bet at 10-1. Could really see anyone winning this one, so let's take a flyer! ETA 5:00 - Catch A Glimpse got off to a good start and battled with her jockey to go to the lead. He managed to calm her down and settled in second, leaving enough in the tank to hold off Alice Springs. The latter was probably the best but got blocked in behind horses and had to check several times. Morning Line favorite - Wedding Toast at 4-1. Odds are about right for a very classy mare in a sensationally deep field - 10 grade 1 winners even with the scratch of last year's winner Untapable, and the absence of champion Beholder. ETA 6:00 - There was one point in the stretch where about 8 horses were side by side with a chance to win. 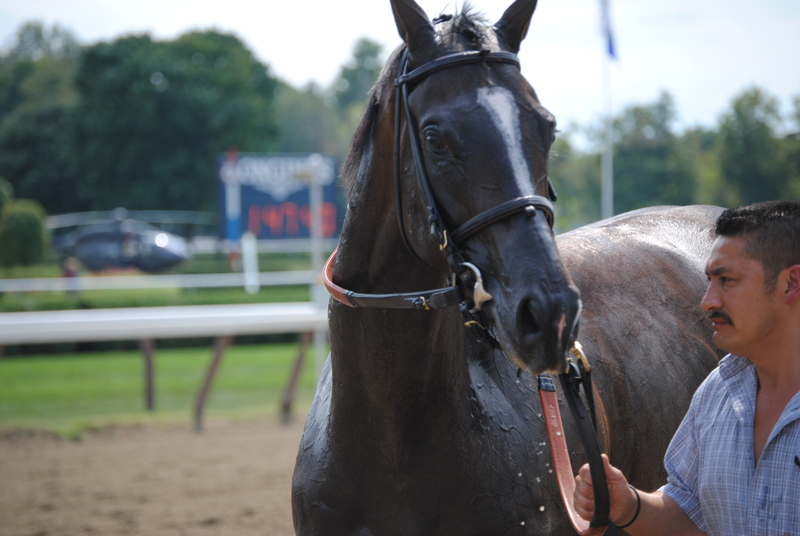 In the centre of the track, Stopchargingmaria charged to the lead, then Sheer Drama came flying on the outside. For the rest of the stretch, Sheer Drama tried to close the gap but Stopcharmingmaria refused to stop. Great race. Stopchargingmaria lost at Saratoga but got her revenge in the big one.